I attended part of the borough assembly meeting tonight. These meetings of our local government change our life more than the ones in Washington DC. The meeting began with an update on the Donlin Gold mine by Mr. Kurt Parkan. Donlin Gold Mine is located near the Kuskokwim River more than 280 miles west of us. So what does that have to do with the Mat-Su Borough? A pipeline from Point Mackenzie is what!…a 280 mile buried 14 inch gas pipeline to power a 157 megawatt generator at that mine. That will be one of the largest generators in the state. This pipeline will cross the Alaska Range at Rainy Pass and then go down the Kuskokwim River Valley. Uber. 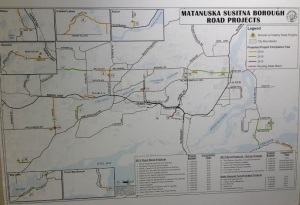 Uber is coming to the Matanuska Valley whether we like it or not and the assembly has to decide what if anything they are going to do about it. If you haven’t heard of Uber it’s time you found out. It’s going to change things. Marijuana. Marijuana is going to change things as well. Washington’s marijuana law recently passed was 60 pages long. Ours is 6 pages so far. The Mat-Su borough will be marijuana central very soon and the assembly has to address regulations about it. Ketchikan Borough may win. If Ketchikan wins their suit against the state regarding education funding the apple cart will be upset for at least a year or two until things are straightened out. The Ketchikan Borough is suing the state about the states requirement that local governments in organized boroughs contribute to the education budget in their area. Unorganized boroughs don’t have to contribute. If the state is required to fund 100% of each school district there will be less money to go around. There was lots of talk about roads. Here is a map of some of the road projects. And that was only 1/2 way through the meeting. People should attend, you will be surprised at what is happening down that the borough building.